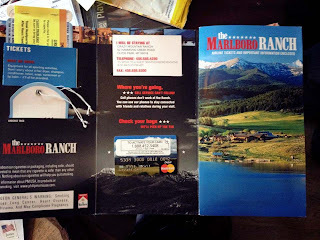 Jayne here - I've been dying to let you all know about this, but couldn't announce it until today. Here it is - the award I received this morning! 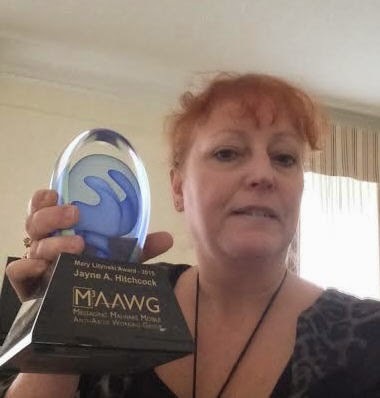 One of the earliest advocates protecting cyberstalking and cyberbullying victims, Jayne A. Hitchcock received the 2015 M3AAWG Mary Litynski Award today for her efforts in assisting targeted individuals, training law enforcement, supporting antiharassment legislation and teaching teenagers how to protect themselves from potential threats. The lifetime achievement award for her work as co-founder of Working to Halt Online Abuse (WHO@) and in aiding thousands of online victims was presented today by the Messaging, Malware and Mobile Anti-Abuse Working Group at the M3AAWG 33rd General Meeting in San Francisco. Hitchcock became an anti-abuse advocate in 1996 when a scammer targeted her with threatening emails and posted defaming messages in her name after she exposed a fraudulent publishing scheme on a Usenet message board. When the local police did not have the tools or knowledge to help her, Hitchcock fought back by learning all she could about the technology. As a result, she became one of the earliest experts on how to identify online stalkers. She testified in support of the first U.S. email cyberstalking bill passed in 1998 and either has helped draft or supported legislative efforts establishing online harassment as a crime in 20 states. In her middle and high school educational programs for students, she shows how the students’ supposedly innocuous social media posts and profiles can make them vulnerable to threats and harassment. “Cyberstalking and harassment are hideous online crimes because victims often suffer in fearful silence without knowing where to turn for help or even that help is available. Jayne has brought this problem out in the open and her commitment has saved lives and kept the industry focused on working together to find solutions,” said Chris Roosenraad, M3AAWG chairman of the Board. About half the cases submitted to WHO@, a volunteer nonprofit organization fighting online harassment, are perpetuated by someone the victim knows such as a friend, ex-spouse or previous work colleague. The other half usually results from “road rage” when an online disagreement escalates to dangerous proportions, Hitchcock said in her acceptance speech at the M3AAWG meeting. “When a communication becomes threatening or harassing, you should respond just once by succinctly telling the perpetuator to stop contacting you. Don’t get pulled into their emotional manipulation or accusations. After that, don’t reply to their emails or other communications but keep a copy of everything. Also be sure to contact the abuse department where the agitation started, such as Facebook, Twitter or Snapchat,” Hitchcock said. To help protect yourself from being harassed, Hitchcock suggested: • Use a gender-neutral email address. • Use an email address from a free provider, such as Gmail or Yahoo!, rather then one supplied by your online service provider. This will make it harder for a stalker to discover where you live. • Avoid heated online arguments – just step away before the discussion becomes toxic. • Do not help friends who are being stalked or harassed by engaging with the perpetrators on their behalf. Instead, support their efforts to stop the crime by directing them to contact the appropriate authorities and abuse desks. In her educational outreach programs, Hitchcock shows students exactly what type of information a stranger can find about them online. Although teenagers are sophisticated in their use of technology, many are shocked at the personal details they thought were private but can be easily accessed. Teenagers also need to understand that cyberbullying can be a crime and there are nonjudgmental people and organizations to protect them. Hitchcock encourages students to report abuse by talking with a trusted adult such as teacher or coach, direct messaging the WHO@ mascot she introduces in the program that is set up on social media, or completing the WHO@ harassment reporting form at www.haltabuse.org, among other resources. “Bullied students often have no clue where to go for help and many are desperate. Students can be very reluctant to tell their parents, even those with good family relationships, because they’re afraid the first line of defense will be to take away their Internet privileges.” Hitchcock said. Since it’s founding in 1999, WHO@ has helped over 4,000 victims and now has a staff of 28 advocates. Hitchcock also has written a book on how to stay safe online, Net Crimes & Misdemeanors, in its second edition, and one exploring criminal exploits linked to the Internet, True Crime Online. A book on cyberbullying is planned for 2016. The M3AAWG Mary Litynski Award is presented annually to someone who has worked tirelessly behind the scenes for many years to help protect online users. Information and the submission form for the 2016 award are at https://www.m3aawg.org/events/maawg-mary-litynski-award. About the Messaging, Malware and Mobile Anti-Abuse Working Group (M3AAWG) The Messaging, Malware and Mobile Anti-Abuse Working Group (M3AAWG) is where the industry comes together to work against bots, malware, spam, viruses, denial-of-service attacks and other online exploitation. M3AAWG (www.M3AAWG.org) represents more than one billion mailboxes from some of the largest network operators worldwide. It leverages the depth and experience of its global membership to tackle abuse on existing networks and new emerging services through technology, collaboration and public policy. It also works to educate global policy makers on the technical and operational issues related to online abuse and messaging. Headquartered in San Francisco, Calif., M3AAWG is driven by market needs and supported by major network operators and messaging providers.